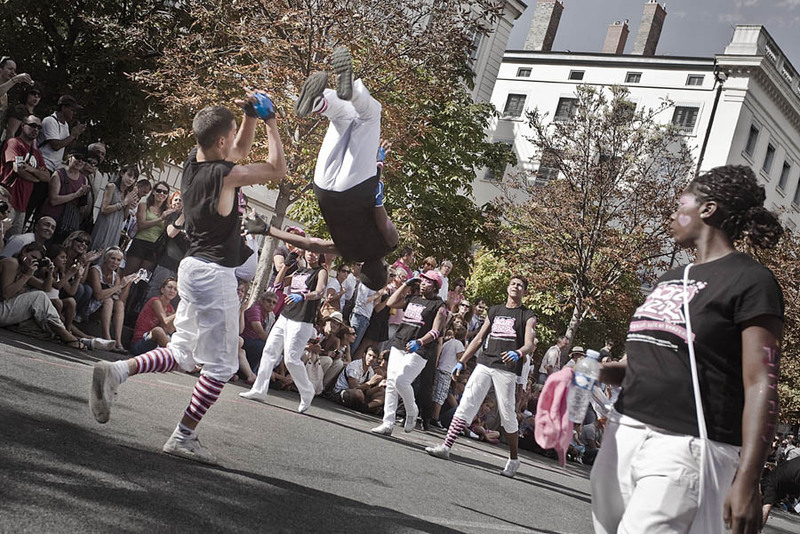 A street dancer is jumping in the air during biennale de la danse opening parade, Lyon, France. I have just spent a very nice afternoon enjoying the parade in the city center. It attracted a massive crowd and it was pretty tough to find some good spots to take pictures. As a side event of the parade, organizers have launched a big competition to collect best pics of the day. I guess it contributed to the rush of thousand (no kidding!) of amateur photographs to the best spots all along the way. So with my friend Olivier we spent most of our time sneaking into the crowd, crawling onto the asphalt and trying to press camera shutters with as less as bystanders'heads into the frame as possible.